Offering classes in I Liq Chuan, The Martial Art of Awareness. This article will be the first in a series of round table discussions with other martial arts instructors and students regarding their views on all things martial arts. This is part one of two. Part two can be found here. Ashe: What do you wish you’d known about martial arts, 10 – 15 years ago, that you know now? What do you know now that you wish you knew then? Jeff: What do I know now that I wish I knew then? Focusing more on reps. Finding a drilling partner and just drill a lot more and get better faster. Not get caught up in the hype. Back when I first started, I got caught up in some of the hype that martial arts was mystical and magical. Looking at everything that was in the magazines like ninjitsu back then; and kenpo, tai chi, all these different martial arts... Just taking what I had and appreciating what I already had and just drilling a lot more. Ashe: It’s interesting that you say that because in I Liq Chuan, we don’t train any techniques at all. It’s all drill-based, so it’s just all “reps”. But sometimes when people are looking at it from the outside, they don’t make the connection between just drilling the fundamental skills, like body skills or whatever you want to call it until it’s, more effortless. Like smooth and natural. I don’t want to say ‘second nature’ because, for us, we always want to do everything consciously, and with attention; like Bruce Lee, right? He talked about “I don’t hit, it hits it by itself” or something like, but that kind of feeling, that muscle memory, training a technique until it becomes reflexive, the attention isn’t there. There’s no consciousness there. So, for [I Liq Chuan], because we put so much emphasis on training with the attention that everything that we do, we want to know. But you still have to train, there’s still a nervous system element there; if you train movements over and over and over again, the nerves that “fire together, wire together”, so you increase the myelination on all those motor pathways to increase the efficiency of how well you move in that movement pattern. But yeah, that’s all of our stuff, and like I said, people see it but they don’t see the connection, or value between just running simple drills over and over again, and high level martial arts skill. Sometimes, with us, I’d say it’s a bit of a shortcoming sometimes to be able to help people bridge the gap between ‘Hey, this is drilling. This is how we drill and then there’s still a little bit of a leap from drills into application. Jeff: Right, and that’s where I’d look at in jiu jitsu, we drill and drill a few times, then stop and not just develop that muscle memory, but also having that type of resistance training that will help prove whether your stuff is working, or not. Because sometimes I’dl do a move back then, and when it goes to a live situation where I try to apply it, it kind of falls short, because I wasn’t adding resistance from a partner. It’s just like in lifting weights, slowly adding more weights over time so you can handle more, it’s the same with technique. So I wish I had more resistance training [against an opponent, i.e. pressure testing] earlier on when I first started and that would have jumped me a lot farther on in progression , just focusing on the fundamentals and then testing them, always testing them. I see how you [I Liq Chuan] guys do it, too, the connection with the hands and you guys move around and it kind of has some form of resistance to be able to move the way you need to move and make the techniques work, the same idea. Training different moves that you can slowly add to sparring.Like, I can tell you from my experience in the striking arts, like with Shaolin Kenpo for example, that’s at the school I was at: when I used it, it was difficult to get the techniques into sparring a lot. Just because of how I was approaching the training process. I would just do the point sparring style; back fist, punch, reverse punch type stuff, but trying to get all the techniques into sparring was more difficult. I should have spent more time trying to drill it more under resistance and figure how to make it work. So, somebody that can be able to kind of find where your 96% mark is, for your threshold for resistance, and kind of keep it right there. That’s one of the things I like so much about a lot of the Thai boxing gyms. You know, when you see those guys training [sparring] it’s almost like play fight. They’re so smooth and relaxed, and they use everything they trained, everything, but it’s almost like full speed, but only 10% power or even 5% power so they don’t hurt each other, and they can play freely with all the different kind of attacks and strikes that they like to use. For me, that’s one of those things that is hard about being a martial arts coach is to be able to get people into that space where they can just be relaxed enough to keep it at that level and not escalating the drill. Coach Rogers has an extensive background in the martial arts, as both a student and competitor. He began his martial arts training in Shaolin Kempo with Shihan Jerry Shaw in June1997 with whom he achieved his 1st degree brown belt. In 2002 he achieved his black belt in White Crane Karate / Hakutsuru under Mr. Larry Naranjo. Coach Rogers began training Brazillian JiuJitsu in 2009, and currently holds a brown belt under Gustavo Dantes, with whom he continues to train in Tempe, Arizona. Coach Rogers is an Army veteran, having served from 2003 - 2009, and then Army Reserve from 2009-2013. He was deployed to Iraq from 05-06. While serving active duty, coach Rogers achieved Army combatives level 3 instructor, after which taught fellow soldiers while stationed in Korea. Over the last two decades, he has competed in various grappling and full contact tournaments. If you're in the Tempe, AZ area, don't forget to check out our special training package. Two weeks of training, plus one private lesson for just $60! After two years of hard work, I'm super happy to announce my nutrition coaching program is finally OPEN. Save $50/month if you sign up before Jan 1! Coaching program is OPEN! Sign up before Jan 1 and save $50 / mo. Only 20 slots available. REFRAME THE STORY We all have a running dialogue inside our heads all the time. Words help us to organize our thoughts and interpret feelings and sensations, but the stories we tell ourselves can set us up for success, or they can also hold us back and set us up for failure. When all you have is a hammer, everything looks like a nail. When we continually tell ourselves stories that focus on past setbacks, we see failure everywhere. Take the example of an intense conversation: My heart is beating fast. This must mean I am about to fail again. Everyone else probably stays calm in these situations. I’m sure they all know I’m failing here. You could tell yourself an entirely different story: I can feel my heart rate is up. I'm pumped and ready to rock! Exact same scenario, but entirely different internal dialogue, and most likely will yield different real world outcomes. So how can we tell ourselves better stories? The video below is of martial artist, and national team champion (Tae Kwon Do) Samery Moras, and her struggles with becoming a national level athlete, and how she finally overcame her struggles to qualify for the national team, and how she reframes her internal narrative when she feels like quitting. Certainly in my nearly 20 years in the martial arts, I've felt like throwing in the towel more than once myself. There's a saying in the Chinese martial arts that days something like "eat bitter to taste sweet". It means something like, if you want high level "kung fu" (skill), then you're going to have to work, and suffer for it. Sometimes these sacrifices can take place in unexpected ways, and you don't even recognize them until the weight of the years starts to pile up and you look back at all the things you didn't do to get where you're at today. My I Liq Chuan brothers and sisters from Moscow recently traveled to Taiwan to compete in a large international kung fu and tai chi tournament. While there, my senior brother Alex Skalozub did some push hands with many of the other Tai Chi masters present. Over the last 20 years, I Liq Chuan has gone from an obscure family martial art style, to gaining an international reputation for turning out highly skilled students. As you can see from the video below, Alex has a tremendous level of skill after training with Grandmaster Sam FS Chin for so many years. The latest episode of the embodiedMIND podcast with Prince Bell and myself. This week's episode we take a run at the topic of GMOs. Genetically Modified Organisms have been a controversial subject, and Prince and I do our best to tackle this complex topic from different points of view. Complete coaching for MIND & BODY. ● Nutrition ● Mindfulness ● Martial Arts ● Start your two week trial today - https://innerstrengthgym.com/shop/tempe-martial-arts-classes-two-week-trial/ Classes held in Tempe, AZ and workshops worldwide. I've been training in adaptation to both hot and cold for several years (each one has particular benefits to health, and performance), but it wasn't until this past October that I attended a formal workshop on the material with the Art of Breath coach Rob Wilson. Although I had done Wim Hof's 10 Week Course, I wasn't completely happy with it. I felt that there were “secrets” missing from the material, some of which I uncovered by accident, in Scott Carney's book “What Doesn't Kill Us”. The workshop with Rob Wilson was a good experience on many levels, the most important of which was just validating my experience with training cold exposure up to now, and also helped clarify my experience with the Wim Hof online course; compared to deep meditation methods like Vipassana or Zen which are meant to completely overhaul your mental “operating system”, cold exposure practice is really so simple, there's not much “how to” to talk about, just do it, and nature pretty much handles the rest over time. The keys are a little bit of intent, and controlling your breathing to manage your physiological state. 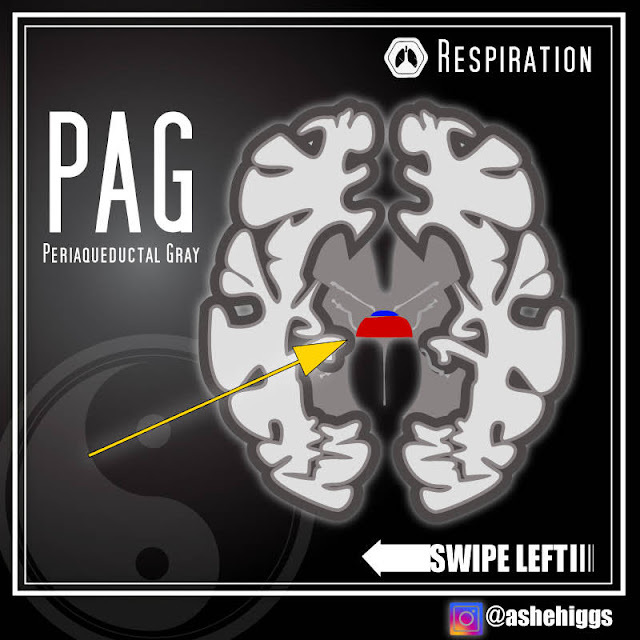 The periaqueductal gray (PAG), also known as the central gray, constitutes a cell dense region surrounding the midbrain aqueduct. In addition, the WHM also engages higher-order cortical areas (left anterior and right middle insula) that are uniquely associated with self-reflection, and which facilitate both internal focus and sustained attention in the presence of averse (e.g. cold) external stimuli. I think one of the more interesting findings from the study was that BAT, or brown fat, played a negligible role in generating heat to maintain core temperature during cold exposure, but instead the muscles of the rib cage, the intercostals, played the chief role by burning massive amounts of glucose. This helps add some understanding to my own experience with the practice, which is that anytime I'm sleep deprived, or in a fasted state I have a much more difficult time resisting the cold compared to when I'm fed, and rested. I commonly fast two days a week, and the first three or four days of every month. In a fasted state, core temp drops a bit anyway, and my system may not yet be fat adapted well enough to efficiently keep up with the higher demand for blood sugar through gluconeogenesis. (I suspect this is true, as I still have not recovered 100% of my exercise performance since switching to a ketogenic diet in June of this year). There was also a recent study done that showed blood ketone levels above 2.0 (which wouldn’t be uncommon during fasting) basically results in “ketone resistance”. Similarly, cortisol levels are high, and you're naturally more insulin resistant when sleep deprived, so again, this could potentially play a role in not being able to keep up with the glucose demands of the “inner fire” practice. 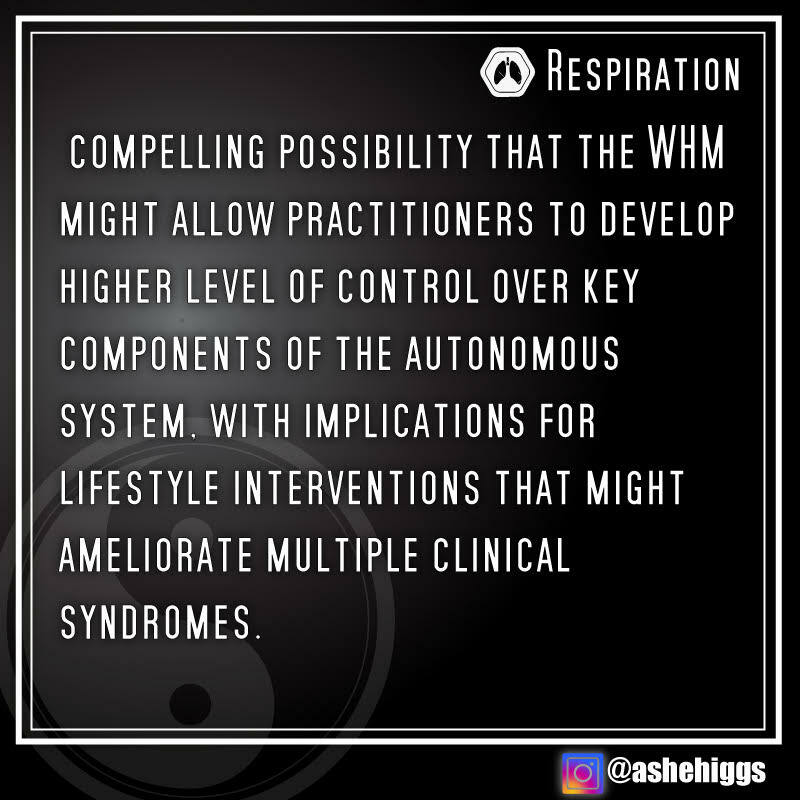 If you’d like a nice animated synopsis of the study and the results, the official Wim Hof YouTube channel released a nice video about it. Complete coaching for MIND & BODY. Staying strong over 40. Sign up for my FREE newsletter👇👇👇 (http://bit.ly/2sGor97) Classes held in Tempe, AZ and workshops worldwide. The old masters discovered centuries ago, that deep breathing practices like qigong and pranayama lead to long life and abundant health. I teach several of these traditional qigong sets as part of our local martial arts classes here in Tempe, AZ including a variation of yijinjing unique to I Liq Chuan, as well as a qigong for health set taught by GM Sam Chin, and the “five contemplations of breathing” taught by Venerable Jiru of the Mid-America Buddhist Association. A new review article recently published in Frontiers in Psychiatry  reveals some of the mechanisms behind such practices, as well as their applications in treating both mental and physical disorders like anxiety, depression, inflammatory bowel disease (IBD) and Crohn's disease. The human gut has an estimated 100-500 million neurons. This is more neurons than the spine, and is the largest accumulation of nerve cells in the human body, and is often referred to as “the second brain”, but is more properly referred to as the enteric nervous system. Well known author of martial arts and qigong books, Yang, Jwing Ming has been writing about this since at least the 90’s. 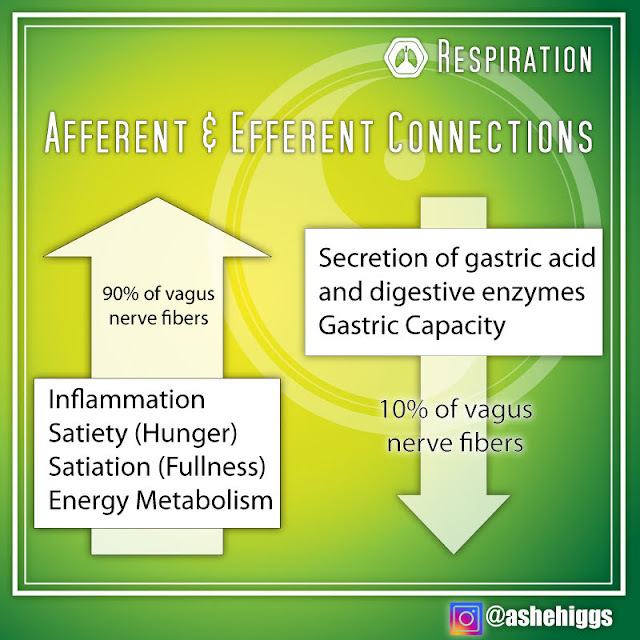 The enteric nervous system produces more than 30 different neurotransmitters and communicates directly with the brain (and vice versa) via the vagus nerve. 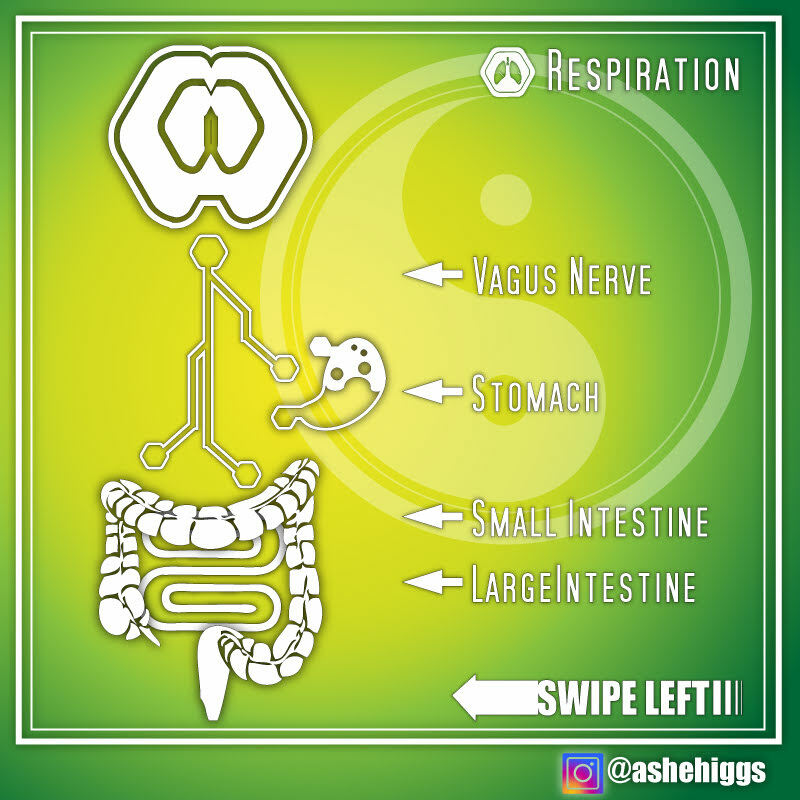 The vagus nerve originates in the brain stem, and extends downward through the torso connecting to all the major organs, including the brain, heart, liver, lungs and the gut. Due to the nature of its length and complexity, it’s called “the wandering nerve” (vagus means wander in Latin). This “two lane highway” between gut and brain via the vagus nerve is referred to as the gut brain axis, or GBA. From an “Eastern” point of view, the body tissues can be divided into yin and yang types like flexors and extensors in the muscles, or arteries and veins in the circulatory system. Nerves are similarly divided into two different fiber types: afferent (long “A” like hay) and efferent (long “E” like feel) fibers. Afferent fibers bring information from the point of contact (stimulus) back to the brain and central nervous system, while efferent fibers bring information from the CNS back to the other end of the system. In other words, afferent fibers bring information “from out to in”, while efferent fibers bring information “from in to out”. In the vagus nerve, a whopping 90% of the nerve fibers are afferent fibers, bringing detailed information about the gut, and the state of its internal environment back to the brain, then to brain stem and limbic system (more on this later), while the remaining 10% of fibers are efferent, communicating information about our external environment and mental state back to the gut. This intimate connection explains why you feel moody when you’ve eaten the wrong foods, or why you get butterflies in your stomach when you get nervous. The nervous system can be divided into two main parts, the voluntary (somatic) nervous system, and the autonomic nervous system, which can be again divided into the enteric nervous system, the sympathetic (fight or flight) and the parasympathetic (rest and digest) nervous system. The vagus nerve is the primary regulator of the parasympathetic branch of the autonomic nervous system. To make a rough analogy, if the nervous system was your house, and the autonomic nervous system your central heating, the vagus nerve would be the thermostat. As you may have guessed by now, breathing practices can directly stimulate the vagus nerve, by increasing the vagal tone, leading to an improvement of autonomic regulation, clarity of thought, improved mood and ability to cope with stress. Simple breathing exercises seem to restore vagal tone, at least in part, through heart rate variability. Each of us naturally has a different heart rate between the inhale, and exhale, as well as from beat to beat. When you inhale, the heart rate speeds up a bit, and when you exhale, the heart rate goes down. Good heart rate variability indicates that you're in a relaxed state, whereas poor variability indicates a stressed, sympathetic state. So by slowing down the number of breaths we take in a minute, and focusing on making the exhale longer than the inhale, we naturally cause the heart rate to drop, which restores vagal tone, and increases relaxation as we shift from a sympathetic, into a more parasympathetic state. Once in the parasypmathetic state, the gut then upregulates production of “feel good” neurotransmitters like serotonin, which go back to the brain, increasing relaxation and beginning a cascade that feeds forward into itself. The old saying goes "happy wife wife, happy life" but "happy gut makes a happy brain" might be more accurate. 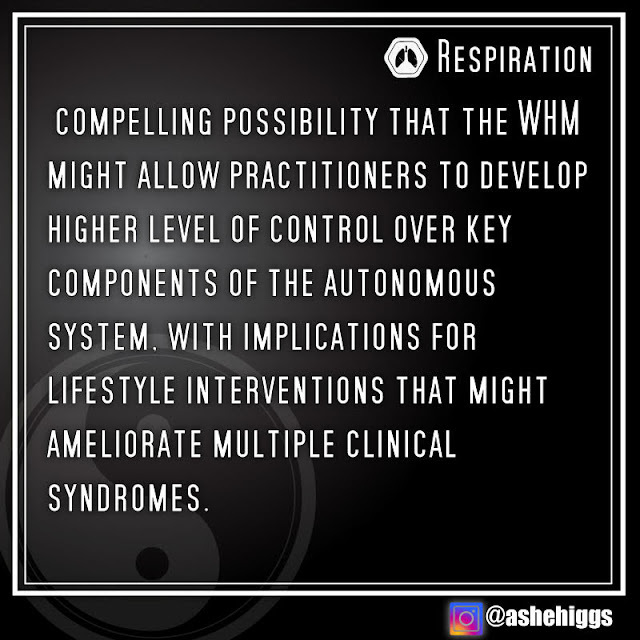 Although the effects of practicing various breathing techniques are at least initially global, masters of breath like Wim Hof have shown that conscious and direct, targeted increases in autonomic nervous functions like immune responses to pathogens like e. Coli can be achieved. Slow your breathing, heart rate drops, and the gut starts doing all kinds of things beneficial to our health. We can do all this consciously because the forward, “thinky” brain is wired into the brain stem through the limbic system (the emotional center of the brain), which is in turn wired to the vagus nerve. Part two will continue with how stimulating the vagus nerve through breathing exercises like qigong and pranayama help to regulate the immune system and improve blood pressure and gut health. "You might be delightfully surprised by the number of people that have used meditation to tap into their own inner reservoir of personal power, and go on to do great things. Meditation doesn't make you weak, strengthens your clarity and focus." Another study recently confirmed the importance of strength in regards to aging. This is especially true when it comes to the lower body. The strength and mobility of the legs allows us to get up and down unassisted in later life. In the clip below, we see Master Jia Anshu demonstrate incredible lower body stability and mobility. Unfortunately, most schools of tai chi do not practice this way. Many studies have shown that regular practice of tai chi can help prevent falls, and improve bone density in seniors, the improvements were modest. Practicing with an emphasis on lower stances could potentially yield a larger return on investment, particularly if training began before old age, and persisted over time. I really enjoyed this episode of the Paleo Solution with Mark Bell. Mark is a world class power lifting coach, but what I found most intriguing were Mark's comments on the value of slow movements (also a cornerstone of the internal martial arts), the need to put in quality work, and how training should not be an event. Every week I bring you the best in training & nutrition from around the web and social media. Sometimes it's my own content, sometimes it's not, but it's always something I found a gem in. Although ketogenic diets are popular for fat loss in the mainstream currently, they are frequently frowned on in athletic circles due to their affect on performance. Many experts like Dom D'agostino however, insist that given a long enough period of adaptation, this initially loss will be recovered. Here we have a fat adapted athlete crushing the fastest time for a 100 mile trail run. Although this is an ultra-endurance event, we are are beginning to see more athletes performing at very high levels under fat adapted conditions. It will be interesting to see if the ketogenic diet starts to take hold in the martial arts and combat sports, even if only in therapeutic applications after careers are over in order to help deal with the after effects of traumatic brain injury. Although during my (short) amateur career as a combat athlete, I never cut weight for a fight, for most fighters an inevitable fact of life is cutting weight for an upcoming fight, and often feeling hungry. When you sit down to eat, and you've been hungry since your last meal, it's easy to miss your 80% fullness cue, and over eat. Here, we have a strategy from Alan Aragorn, which basically amounts to filling yourself up on water in advance of your meal. When I was young, all of my friends were on the wrestling team, and they would quite often use very poor choices to cut weight, like eating one slice of pizza and calling it good for the day. No matter how strategic, or backed by peer reviewed research a tactic like filling up on water before meals, should not be used until basic, sound nutritional skills, like focusing on whole foods and meal prep are mastered, however, for those combat athletes who must shed fat before a fight can use this trick to help make it through the inevitable periods of hunger that can last for days, weeks, or even months (note that this tactic can not be used during weight cutting in the week, or two prior to weigh in, when dehydration is the key strategy). Shaq vs. Forrest Griffin in the octagon?! It happened folks and you saw it here first! Of course this was just a little playful exhibition match, but it would have been nice to see Forrest go a little harder just to see what the weight and size vs. skill difference really would have made. Despite his tremendous size, Shaquille O'Neil was an incredible athlete who could really move, so although Griffin is the veteran here, Shaq's size and sheer athleticism could have posed a real challenge. I have a friend in Vegas who know's Griffin personally, and he says he's pretty banged up after his UFC career, so I'm sure just avoiding injury was the main objective here. As a martial arts instructor just cresting into middle age myself, I completely understand. In the video below, YouTube creator and meal prep extraordinaire Bobby Parish takes you on a tour of Costco to his top picks for eating well. I was shocked to learn about Costco's organic eggs receiving such a low ranking from cornucopia.com. For me it underscored that we should frequently check ourselves: what do I know, and how do I know it? Quite often the narratives the we spin in our own heads do not match up to reality. I had begun a narrative in my mind that all Costco products must be good, because that narrative aligned with how I feel about Costco as a company, and how they treat their employees. Similarly, people often sabotage their own efforts at nutrition by spinning a story around their choice like "it's okay I ate a dozen donuts just now, because I'm heading to the gym, and I need the pre-workout..."
Lean mass favors protein. More protein in your diet will lead to better all around body composition (more muscle, less fat)! If you're getting older, and your weight is becoming an issue with your martial arts practice, focusing on including more protein in your diet (and less refined carbohydrates) can be very beneficial. My martial arts brothers and sisters from Moscow performing a demo in Taipei last weekend. So proud of my kung fu family! A post from my friends over at Power Speed Endurance on the neurological connection between the breath and the brain. If you're looking for a little bit of the science behind why you should be practicing your qigong / pranayama it's about three minutes long. Our most recent episode of the embodiedMIND podcast with my partner Prince Bell from Golden Bell Training. Falling Leaves Kung Fu is the ONLY source of I Liq Chuan - The Martial Art of Awareness in Tempe, AZ. ● Nutrition ● Mindfulness ● Martial Arts ● Staying strong over 40. Check out our coaching programs for men, or women and find your inner power💥✨! Classes held in Tempe, AZ and workshops worldwide. We are currently looking for a new location. Please use the contact form above to find out where we're currently meeting to train in the interim.